Klaberjass (Klabberjaß), also known under a variety of alternate names and spellings, such as Kalabrias, Clobyosh, Clob, and Bela, is a two-player melding and trick-taking game that likely originates from the Low Countries. It is particularly commonly played in Scotland and in Jewish communities worldwide. Klaberjass heads up a family of games known as the Jass or Jack-Nine games, so named because the jack and 9 are the highest trumps in the game. This family also includes the popular French game Belote. Klaberjass, whose name is derived from clover Jack (i.e. the J♣), bears some similarity to Piquet, but with more emphasis placed on the game’s trick-taking aspects. The object of Klaberjass is to be the first player to score 501 or more points by forming melds and taking tricks. Klaberjass is played with a stripped 32-card deck identical to that used in Piquet. 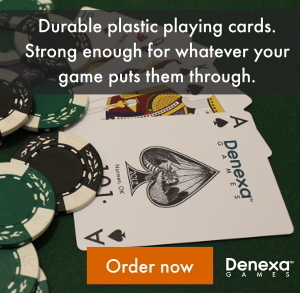 Starting from a deck of Denexa 100% Plastic Playing Cards, remove all the 2s through 6s, leaving the aces through 8s in all four suits. You’ll also need something to keep track of the score with, such as a pencil and paper or score-keeping app on a smartphone. Determine the first dealer by some random method. Shuffle and deal six cards to each player, in two batches of three. Place the deck stub in the center of the table and turn one card, the upcard, face up next to it. One of the distinguishing features of Klaberjass is its idiosyncratic card ranking. As in Pinochle, the 10 ranks higher than the face cards, just under the ace, giving a full ranking of (high) A, 10, K, Q, J, 9, 8, 7 (low). In the trump suit, however, the jack and 9 are elevated to the highest and second-highest trumps, and are known as jass and menel respectively. In the trump suit, the cards rank (high) J, 9, A, 10, K, Q, 8, 7 (low). Note that although these rankings apply to most aspects of the game, for the purposes of sequences, the “natural” order still applies, with ace high (A, K, Q, J, 10, 9, 8, 7). So the highest four-card sequence would be A-K-Q-J, not A-10-K-Q or J-9-A-10 in trump. Selecting the trump suit in Klaberjass comes with a fair degree of danger. The player that chooses the trump is essentially declaring that if they get the chance to choose the trump suit, they will win the hand; if they fail, then any points they scored are attributed to the opponent instead! Therefore, it’s quite important to not agree to choose trump lightly. The non-dealer gets first opportunity to select the trump suit. They may either accept the suit of the upcard as trump or reject it by passing. They may also schmeiss (see below). If they pass, the dealer then has the opportunity to accept the upcard’s suit as trump, pass, or schmeiss. If both players pass, then it goes back to the non-dealer, who then has the option to declare any one of the other three suits trump, pass, or schmeiss. If they pass, the dealer gets the same option. If the dealer passes, then the hands are discarded, the pack shuffled, and a new hand is dealt by the same dealer. A schmeiss is an offer to throw the hands in and have the same dealer deal a new hand. The opponent says “yes” or “no” to this offer. A “yes” results in a redeal. If the response is “no”, then the player who called schmeiss is compelled to either accept the trump suit as turned up (in the first round of bidding) or name one of the other suits (in the second round). The player who eventually declared the trump suit is called the maker. After the trump suit is determined, each player is dealt three more cards, giving them each a total of nine. If the upcard was used to determine the trump suit and a player holds the 7 of trump, called the dix (pronounced deece), they have the option to lay the dix on the table and take the upcard into their hand instead. Melds are declared through a series of formalized messages designed to allow the pertinent information to be collected without unduly revealing the contents a the player’s hand to their opponent. 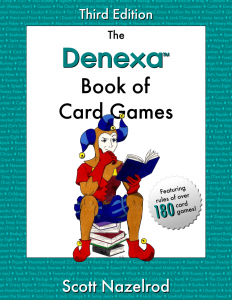 The non-dealer declares their highest sequence first, saying either “I have a twenty” or “I have a fifty.” If the dealer cannot or does not wish to declare a better sequence, they simply say “Good”, and the hand proper begins. If the dealer unquestionably has a higher sequence (as would happen if the non-dealer had a twenty while the dealer holds a fifty), they reply with “Not good”. If the dealer holds a sequence of the same length as the non-dealer, more information is needed to ascertain whose sequence is better. If so, the dealer asks “How high?” The non-dealer replies with the highest card in their sequence. If the dealer cannot best it, they say “Good,” with precedent going to the non-dealer. Otherwise they say “Not good, mine is [rank] high,” establishing the dealer as the one with the best meld. If the dealer’s sequence has a high card of the same rank, they say “I have also.” The non-dealer then declares the suit of their sequence. The dealer does likewise; if either of these sequences are in trump, then the trump sequence wins. Two non-trump sequences simply tie and no melds are scored for that hand. After the first trick has been played, but before the second begins, the player who was established to hold the higher meld reveals all of the melds in their hand. These points are not actually added to the hand score until this player wins a trick, however. Note that declaring sequences is entirely optional. If there is a decent chance that the maker may not win the hand, they may choose to forego any points available from melding to avoid risking the opponent scoring them. On a trump lead, they must play higher trump if possible. If they can follow suit, they must. If they cannot follow suit, but can trump, they must. If they cannot follow suit or trump they may play and card. The highest trump wins the trick, or the highest card of the suit led, if there was no trump played. The winner of the trick collects the cards into a won-tricks pile in front of them, then leads to the next trick. The king and queen of trump form a meld called bela. Bela is not declared at the beginning of the hand with the other melds. Instead, the player simply calls “bela” when the first card of the combination is played, and “from the bela” when the second card is played. Bela is then added to the hand score, with a value of 20 points. Jacks (other than jass): 2. These scores are added to the amount scored through melds on that hand to arrive at the final hand score. The maker and the opponent’s hand scores are then compared. If the maker’s score is higher, both players score their respective hand scores to the game score. If they are tied, the opponent scores their hand score. If the opponent has the higher hand score, then the maker is said to have gone bate, and the opponent scores both their own hand score and the maker’s. The winner of each hand deals the next one. Game play continues until one player scores 501 points or more. The player with the higher score is the winner. I have 3 siblings and we live in different countries and grew up playing a card game called Klaberjass. I’ve been trying to find a way for us to play online against each other (it’s a game where 4 people play – each with a partner, much like bridge). Do you have any idea how we might go about doing that – I’ve been looking online but struggling to find a solution. Kobi Reiter had a free Kalabraisz program on the web, but I think this link is now defunct. Klob is a great game, and the three-handed version is similar to the normal 2-player game. Whoever cuts low card deals, bidding and the right to nmae trump passing to the left. The Bidder has to score more than the combined total of his/her opponents; if they fail in their bid, going bete, each opponent divides Bidder’s score equally between them. Bela can be played at meingames.de as Debertz.